Abdet - small village close to Guadalest, and only 21 kms from Benidorm. Traditional village with narrow winding streets and white houses. Wonderful views of the Costa Blanca mountains. 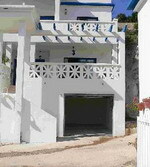 Two traditional town houses available for rent in the Spectacular Costa Blanca Mountains. 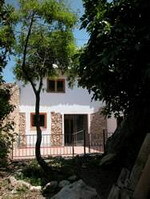 Situated in the village of Abdet, near Guadalest, yet only 21 kms from Benidorm. Stunning mountain views from the roof terraces and bedrooms, superb walks and adventures on your doorstep. Full information packs for walking, cycling, climbing and other activities are supplied. The houses feature plenty of well appointed bathrooms (one ensuite), and spacious bedrooms. Other features are "double height" living area, private garden/patio, open fire/stove for those cool winter evenings in this peaceful mountain village. There is even a secret hiding place, a reminder of Spain's relatively recent turbulent history. 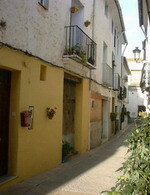 Algar de Palancia - small traditionally Spanish town, 20 minutes from the beach, and 25 minutes from Valencia City. Experience real Spain here in a traditional village house set among beautiful scenery and orange groves. Algar is well placed for the beach and Valencia city but offers you the chance to explore more rural Spain and its wonderful people. Great for children, too, as the village has limited traffic, and the house is in a no through lane bursting with flowerpots and next to the main square. The children will love running wild and, if they need cooling down, the open air municipal swimming pool is 300 metres away, again very easy to access. The house has 2 apartments.The 1st floor apartment (Apartment 1) has 2 double bedrooms,one of which has an 'alcoba', a traditional dressing room just before the bedroom and a single room. Benidorm - a coastal town located in the comarca of La Marina Baixa, in the province of Alicante, Spain, by the Mediterranean Sea. Until the tourist industry began in the 1960s, Benidorm was a small fishing village. Today it stands out for its hotel industry, beaches and skyscrapers, which were built as a result of its tourist-oriented economy. Benidorm has three major beaches: Levante, Poniente and Mal Pas; all of them have a blue flag, the maximum rank granted by the European Union. The Aparthotel Levante Club is located in Benidorm, Spain, just two blocks from the beach, and two kilometres from Triangular Square. Aqualandia Water Park and Mundomar Dolphin Park are both one kilometre away, and Alicante Airport is 42 kilometres distance. 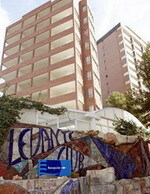 A modern apartment complex, The Aparthotel Levante Club has a heated covered swimming pool for winter, and three outdoor pools. There is a children's play area, television lounge and 24-hour reception with currency exchange services, and a car park nearby. The hotel restaurant serves cold and hot buffets of salads, fish and meats. There is also a poolside bar. The half-board rate includes lunch and dinner. 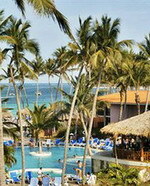 Entertainment is arranged on site and staff can organise excursions. The 138 apartments sleep up to four people, and have kitchenettes, bathrooms, satellite television, safes, and balconies or terraces. 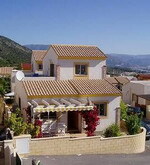 Beautiful Villa, located only 12-15 mins from Benidorm by car, Communal pool, Fantastic Views, Roof terrace, Patio, Barbeque. 3 Beds, 2 Bathroom. Consider our Villa your home for the duration of your stay. Situated on a well lit and safe private road on a secluded estate with very friendly residential neighbours of various Nationality, mostly English speaking. Very well equiped to a high standard it comes with all modern facilities to make your holiday as relaxing as possible. The Estudios Benidorm residence is housed in a contemporary five-storey building located 50 metres from the beach in the Spanish resort town of Benidorm. The railway station is one kilometre from the hotel. Alicante Airport is 55 kilometres away, with an approximate driving time of 50 minutes. The residence's front desk is staffed around the clock, and all floors are accessible by lift. Guests can use the facilities at the Hotel Benidorm Plaza, 150 metres away, including a restaurant, an outdoor pool with a poolside bar, a sauna and a jetted tub. The 70 studios over five floors feature light decor and functional furnishings and open onto balconies. All include kitchenettes with coffee/tea-makers, refrigerators, cookware and dishes. Other amenities include satellite television, climate control and safes. If you are looking for a fabulous holiday complex with everything in your doorstep,then this is a great choice for you. This Apartment is situated in the centre of Albir where the best restaurants and bars are in the town.Ideal for families who plan to spend their holiday lazing around the pool. There is a bus stop opposite to "Mendoza" supermarket which goes into Benidorm or Altea and the beach is 1100 metres away. 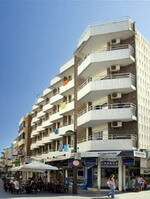 There are taxis stopping opposite the supermarket at the main entrance of "Albir Gardens". All the Theme Parks are within 5 miles from the apartment and with Acualandia and MundoMar only 1500 metres from the complex the enjoyment is guaranteed. Sleeps 4. Peñíscola- "..one of the most beautiful areas on the East Coast of Spain. Costa del Azahar is also known as the Orange Blossom Coast. Surrounded by picturesque countryside amongst orange groves, rosemary fields, holly oaks, olive trees and almond trees. Situated next to an impressive Irta´s Saw nature reserve, which is ideal for those who wish to go on bike tours, mountain biking, mountaineering, horse riding and donkey treks as the are is well sign posted. If you prefer watersports, 1.5 miles away is the longest fine sandy beach in North East Spain. There you will find a windsurfing school with skin diving, surface and submarine fishing and lots of other water activities close to hand. Not forgetting that we are one hour drive from Salou´s great theme park Port Aventura and waterpark, suitable for all the family." This charming complex combines a spa and rural-style holiday dwellings and is the ideal place for a tranquil holiday surrounded by nature on the Costa del Azahar. Relax and make the most of the excellent spa centre in this complex. You can also get more active by playing a game of tennis or enjoying a swim in the pool. From Spa Natura Resort you can also stroll into the beautiful surrounding countryside, including the nearby Sierra de Irta. There you can go for walks, bike rides, or try out adventure sports. Dine in the onsite restaurant, the Azahar, where you can sample local-style cooking without leaving the complex. Guestrooms - Hotel Rooms: 164 including kitchens, air-conditioning and cable television.